I used Logitech’s diNovo keyboard for Mac for years and loved it. But a couple of keys broke and so I wanted to get another. 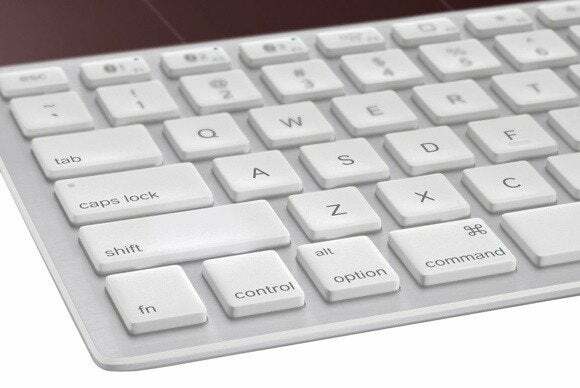 Unfortunately, Logitech doesn’t make them any longer so I got their Wireless Solar Keyboard K750 for Mac. I like the feel of the keyboard but the Caps Lock key drives me nuts. Not only doesn’t it light up when you push it, but you can’t use Keyboard preferences to turn it off. I’m always hitting it by mistake and THEN THIS HAPPENS. Any way to fix these problems? You can do something about each issue. We’ll start with the light. I agree that it’s unforgivable for Logitech to leave out a light that tells you when Caps Lock is engaged. How much could a puny LED cost? Still, it is what it is. So let’s talk about an alternative. CapSee displays this icon when you press the CapsLock key. I’m not going to suggest that you break out the soldering iron. Rather, I’ll ask you to download a copy of Threeimagination’s free CapSee. To install it you must Control-click (right-click) on its icon, choose Open from the resulting menu, and then click Open again as it’s an app that OS X’s Gatekeeper is unfamiliar with. Drag it into your Applications folder and launch it. Now when you press the Caps Lock key, an icon will appear on your desktop telling you that you’ve done so. Because CapSee needs to be running for this image to appear, you should configure it so that it launches when you start your Mac. To make that possible, open System Preferences, click Users & Groups, select your user account, click the Login Items tab, click the plus (+) button at the bottom of the items list, navigate to your Applications folder, and select CapSee. If, instead, you prefer that the Caps Lock key simply ceases to function, download a copy of the free Seil from pqrs.org. Before launching it, go to System Preferences, select Keyboard, click Modifier Keys, and from the Caps Lock Key pop-up menu, choose No Action. On other keyboards this would disable Caps Lock, but it won’t work with your Logitech K750. Now launch Seil and in the resulting window enable the Change the caps lock key option. By default, Seil will turn Caps Lock into a Delete key. As I prefer that Caps Lock does nothing at all, I click on the keycode area and enter 110, which is a code for producing a PC menu, which does nothing on a Mac. If you just want Caps Lock out of your hair, try Seil. Of course if you choose to entirely disable the Caps Lock key there’s no reason for you to install and use CapSee. Have a question of your own? Drop a line to mac911@macworld.com.